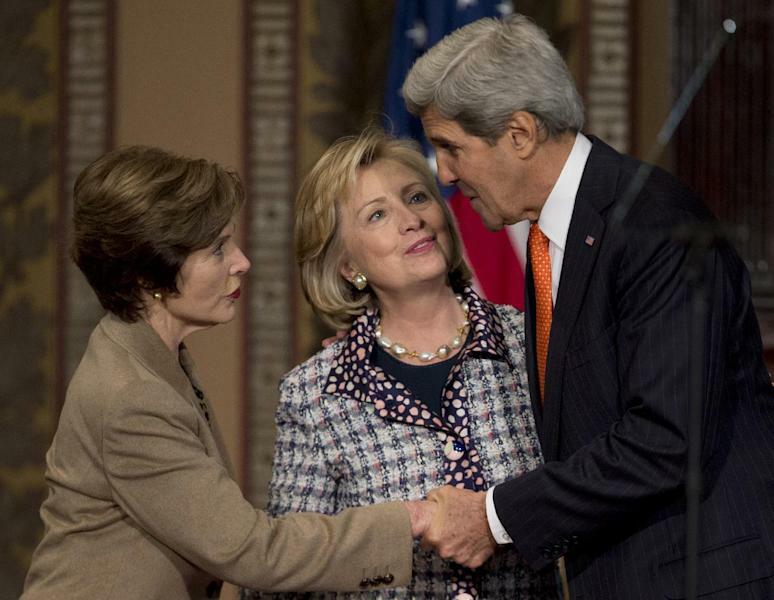 WASHINGTON (AP) — Secretary of State John Kerry and his predecessor, Hillary Rodham Clinton, said Friday that Afghanistan is reaching a turning point in maintaining the advances made by women in Afghan society and any future security agreement needs to respect the rights of women. Kerry said Afghan women and girls have made great progress since 2001, enjoying greater access to education, health care and technology. But he said many women in Afghanistan remain concerned that the nation's society could revert back to the repressive days under Taliban control. "When Afghan women move forward, believe me, they never want to go back, not to the days when the Taliban ruled Afghanistan," Kerry said. He said the achievements of women in Afghanistan "is nothing less than remarkable" and it would be a tragedy if those gains were threatened. Under Taliban rule, girls were barred from attending school, women were forced to stay indoors and cover their heads and faces with burqas. 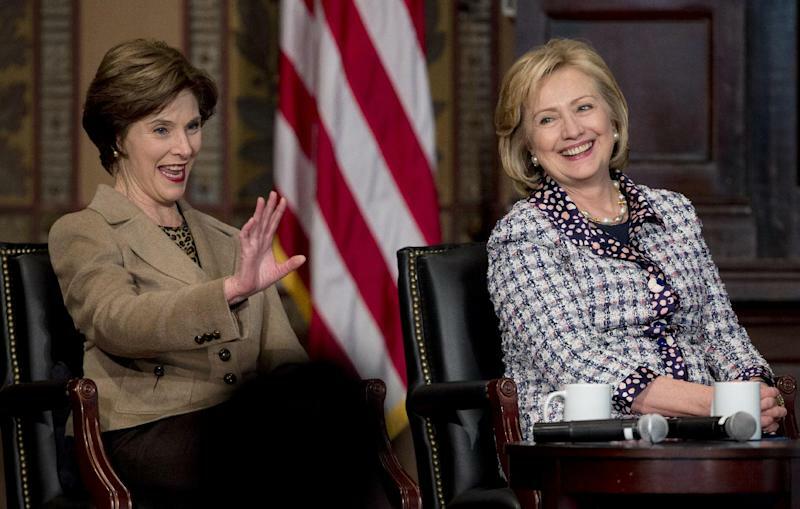 Kerry, Clinton and former first lady Laura Bush noted during a forum at Georgetown University that Afghan women and girls have made great strides, attending school, serving in their country's legislature and owning their own businesses. Coalition combat forces are scheduled to leave Afghanistan at the end of 2014 and the U.S. and Afghan government are negotiating a security agreement that will determine whether the U.S. leaves in place a small combat force of between 8,000-12,000 troops after next year to train and advise the Afghans. Kerry expressed optimism that an agreement could be reached in the coming weeks, saying the two nations are "closer than ever" to completing a security plan that will define a new partnership with Afghanistan. Clinton said security was the "paramount issue" going forward and expressed hope that U.S. troops would be granted immunity from local arrest and prosecution under any agreement. Clinton noted that an agreement on immunity could not be reached with Iraq before U.S. forces departed and the country has been "descending into a cycle of terrible violence." "This is a big decision for the Afghan government. If you enter into a bilateral security agreement, it doesn't mean that the United States will be there in great numbers. 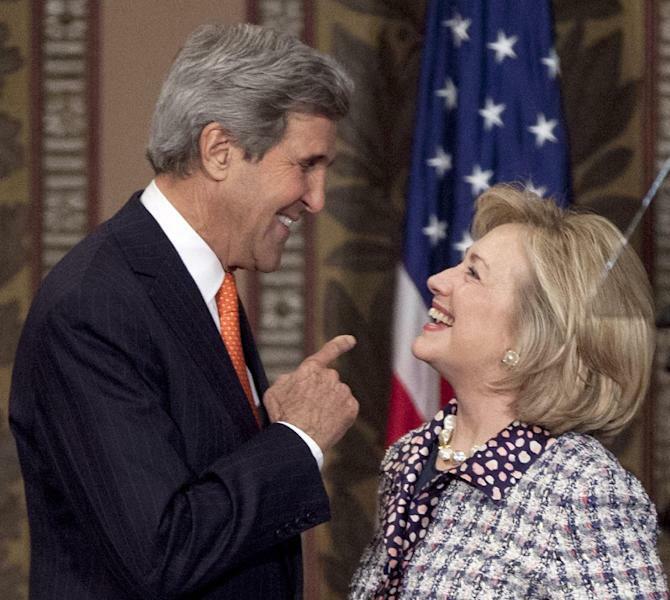 It means that we will be available to help support the security forces of Afghanistan," Clinton said. If it is not signed, Clinton said the Afghans will be "left totally to themselves." Bush said as U.S. forces transition out of the country, it will be important for Americans to maintain a connection to Afghanistan. "I'm so worried that once our troops leave, nobody will pay attention to Afghanistan," Bush said.